If you are a devoted fan of vigorous workouts and are looking for an elliptical that fits your needs and does not cause a bump on your bank account, then you have come to the right place as today we are reviewing Exerpeutic 1000xl Heavy Duty Elliptical. This Elliptical is one of the most affordable elliptical available in the market right now. 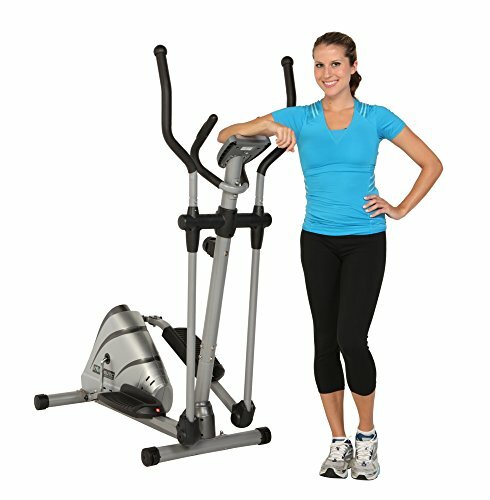 When we first came across this machine we were surprised by the name because it has “Heavy Duty” in its full name and for a machine with such a minimal price tag and such a compact design it did not seem like a heavy duty elliptical, but make no mistake as this machine is one of the more high capacity elliptical trainers. It is designed to provide you with an effective workout for both your upper and lower body using a natural elliptical motion that eliminates any kind of bouncy motion so that it does not put stress on your hips or knees. Though this machine is one of the popular elliptical trainers but choices vary from customer to customer, let’s review all there is to Exerpeutic 1000xl Heavy Duty elliptical and find out if this is the machine you are looking for. We’ll start with the heart of Exerpeutic 1000xl, which is its drive system. This machine comes with a precision balanced flywheel that works with the v drive system to provide smooth and noise free workout so that you can exercise while watching your favorite show on TV without waking up the person sleeping in the next room. The pedals attached to the wheel are high grade and are designed in such a way that prevents your feet from slipping during your workout eliminating any chance of injury. The pedals may seem bigger than your feet but that’s only because they have a raised front lip section. Though the pedals do not have any toe clips or straps but to provide extra grip the surface of the pedals is ribbed. The stride length on this machine is 13 inches. One of the features that we loved the most is the two way pedaling motion. Pedaling in reverse lets you focus on a different group of muscles. Exerpeutic 1000xl Heavy Duty Elliptical features mechanical resistance with 8 different levels. These levels of resistance can be toggled by a simple turn of a knob. The manufacturers have made sure that the resistance on this machine caters for any level of workout from beginner to professional. Multiple levels of resistance can also be helpful in testing your limits and pushing them in order to challenge your muscles and increasing your muscular strength and stamina. The machine comes with two sets of handle bars. One is the main set which moves back and forth with the movement of the pedals while the other is fixed, facilitating the trainee to choose between combining upper body workout with lower body workout or just resting the arms on the second smaller set of handles. Combing the workout with arms gives you an extensive form of full body work out which guarantees rapid and safe weight loss ranging from 1000 calories per hour on high intensity to 800 calories on low intensity. 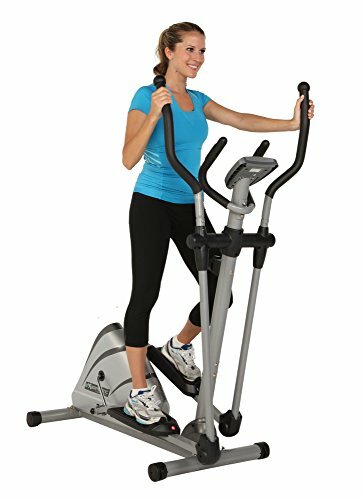 Exerpeutic 1000xl Heavy duty Elliptical comes equipped with a heart rate hand sensor placed on the smaller set of handles. Between the small handles there is an easy to read large view LCD screen that indicates distance, time, speed and calories burned. However, if you are used to commercial quality elliptical trainers at your gym you might feel like the display control on this particular trainer is quite basic. 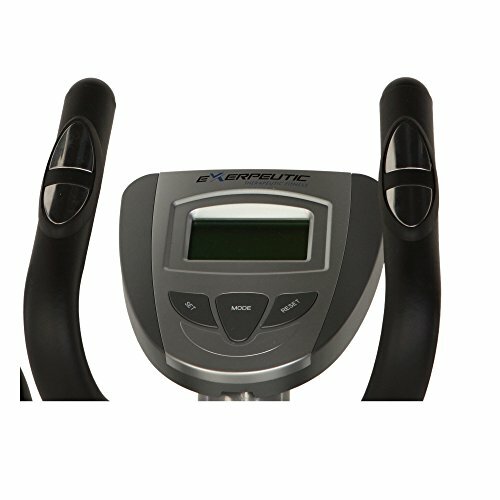 A number of customers have also reported the heart rate sensor to have fluctuating readings but this is the problem that almost all of the built in computers on budget elliptical trainers. If you want to track your heart rate accurately we would recommend you to purchase a separate heart rate strap. The computer on this machine is not all bad though, as it allows you to choose a basic workout goal by pressing the mode button on it. It lets you choose between time distance and calories and will notify you when you reach your selected value. These goal, however, are very basic so if you want to follow a workout plan you may have to keep a journal and record your everyday workout. The quality of instruction manual that comes with this machine has received a lot of attention in the customers’ reviews. A few users did find the assembly process and the instruction to be lengthy and complicated but overall most customers claim to have assembled the machine in sixty to ninety minutes depending on the skills of the person. The Exerpeutic 1000xl user manual includes everything that you would need to assemble the machine and starting working out on it. It includes a full list of all the parts of the machine and a plethora of tools required to set up the machine. The instruction manual gives step by step instructions to get started and not only that it also comes with a guide to warm up and stretch before using the machine in order to prevent any kind of injury. While there are a couple of steps that are quite confusing and could have been divided into two steps and some customers may be overwhelmed by all the steps and instructions but if you follow the instructions step by step the assembly of this machine is quite basic. Exerpeutic 1000xl comes with a warranty but it varies from vendor to vendor. However most of the vendors provide a two to three year warranty for the frame and a ninety days warranty for the parts. checkDual workout, both upper and lower body. times-rectangleSomewhat challenging assembly. Instructions are difficult to follow at times. 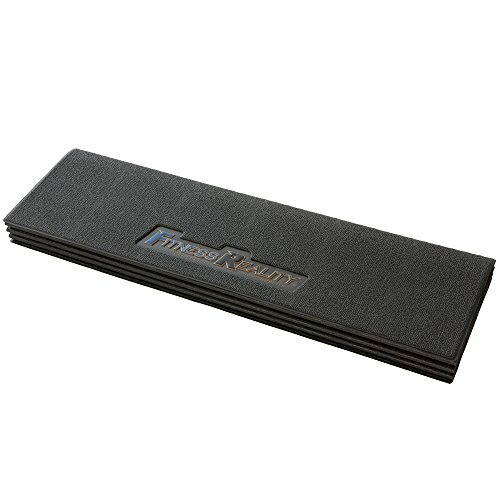 times-rectangle13 inches stride length can be frustrating for people who like to take large steps. The Exerpeutic 1000Xl Heavy Duty Magnetic Elliptical is an incredible bit of gear for the entire family. The drawback is that the stride length is a bit on the short end, and settles on it a terrible decision for anybody more than 6 feet. It doesn’t gloat the most ergonomic plan, neither does it have the best parts, but then what you get for the price you pay is truly noteworthy and if you are just looking to lose some weight in a limited time, this is the machine for you. This elliptical brings to the fold an absolute cardio workout that is bound to serve your exercise needs well.